Samson was a judge for over two decades. You don’t do any job for over two decades, especially one that is intense and involves leadership without maturing and learning some things. So we can conclude that in some areas Samson was mature. Most pastors I know haven’t been in the ministry for over two decades – and the ones that have I look up to, but Samson had – he was a seasoned veteran minister. But Samson was also – at the same time- ridiculously immature, and childish. In Judges 15, Samson catches 300 foxes and ties them together in pairs by the tail, then he set fire to the foxes and released them in the Philistine’s farms. That’s because they gave his fiancee to another woman! That’s not mature behaviour. It’s a childish mind that comes up with the idea to catch hundreds of foxes and tie their tales together. If you want to burn a farm, any adult can give you a hundred easier ways than catching several hundred foxes! So Samson was mature and immature at the same time – and I, and you, know many Christians who are sadly the same. They know the Word of God really well, but they are childish. A child is unsteady – one of the hallmarks of a child is they can’t sit still, they have to move around. Childish Christians are always on the move – a new church, a new project, a new ministry. There are so many child Christians who despite their knowledge of the Word cannot settle in a church. Today you will meet them in one church, tomorrow they will be going to another church. They are unsteady, unstable, yet they have great knowledge. It takes a bit of maturity to go to church! Another hallmark of a child is they cry really easily. Children get hurt so easily, and cry at the drop of a hat, and need a lot of time and attention. Immature Christians are the same! Childish Christians can know the Bible and be mature in one level, but on the other level need lots of attention or get upset really easily. We have to be mature in every area of our life – it’s no good being mature in ministry, but immature in the marriage! We need to settle in marriage, in church, in life and be mature! This is the third part of a series on split personality, parts 1 and 2 can be found here and here. The danger of having a person with a split personality around you, having a Samson in your church, is that they are simultaneously both strong and weak. For them personally that is a huge issue, but it is also an issue for everyone around them. Firstly, it is hard for people to know that people like that need help, because in their public life they look so strong, they look so devoted to God. As a pastor, if you assume someone like Samson is strong and mighty, why would you offer to help them? If you are Samson, if the first couple of posts have located you in some way, you need to now become vulnerable and ask for help! You need to let people know that you are compromising and need freedom. Do it now because things will only get worse if you do not. When you look strong, but are weak in private, nobody can actually help you. But when you say “I am weak here”, people can get into your life and help you. As a pastor, there are some people in my church who are genuinely low maintenance, they don’t really need a visit from me, and they don’t need counsel. They are strong people, strong in the Word, strong in the Spirit, strong in love. But when I see a weak one, I want to help them. But if you are weak, but you act like Samson in public, you will not get the help you really need. And that’s true across every church. Samson had a mighty ministry, killing many many enemies of God, but in private he was a weakling. He was both strong and weak. How he was at home was not how he was at church. In Judges 16, in one verse Samson is running away with the gates of the city on his back, in another verse he is allowing Delilah to dominate him because he cannot say “no” to a woman. Strong and weak! In the same chapter! And that’s how the enemy beat him in the end – through his weakness. Samson’s pastor didn’t know his weakness, but the devil did. There might not be a single human who knows your weakness, but the devil does. So tell some humans who are strong, and deal with this before the devil traps you and deceives you and you are the “whom he may devour”! A lot of politicians are Samsons, one thing in public, and another in private. We are not called to be politicians, but people of integrity, so let’s get this sorted – and church, especially elders and pastors – if strong people open up to you that they are weak, don’t manipulate them, don’t accuse them, don’t mock them – but those of you who are spiritual: restore them! Love them, help them deal with their weakness, be firm but be kind. Next post – let’s look at how to deal with it when Samsons stab you in the back. Samson essentially played games with God. He looked good in his long hair, which let everyone know he was part of church, and being good, and fitting in, and earning him praise with the church-people, but he was cheating on God with the world. He was godly and worldly, and that never works. I know people who go to church to pick up girls. I was at a conference not that long ago and some of the teenagers in my church heard some of the youth leaders discuss the young teen girls and give them marks out of ten. Then immediately go on and minister in the gifts and teach the Word. Godly and worldly – it never works. I saw a lady once in come to a prayer meeting. I know she had just been having an affair, cheating on her husband, but she strode into the prayer meeting, speaking in tongues and prophesying over people. Godly and worldly – it never works. Playing games with God is when you are godly and worldly. And one of the hallmarks of people who play games with God and have a split personality is sexual immorality. Samson walked through the town with his long hair, letting everyone know how godly he was, but he wanted to marry an unbeliever. His own dad was stunned by this duplicity, and was stunned his son didn’t want to marry a godly woman. I have seen men come to our church to get a woman, and then have nothing to do with God as soon as they are married. Split personality, playing games with God, godly and worldly. And it never works. How could a person ever think of marrying an outsider when you are believer separated to God? What a dangerous place to be in – marriage is not a game, it is a lifelong covenant. You should desire to be married not just to another believer, but to someone utterly on fire fire for God. Samson is a case study in contradictions because he was very godly, and very worldly. If it wasn’t for the grace of God, this could never happen, and if you don’t understand the grace of God, you will marvel it could happen, but the truth is that the Spirit of the Lord moved Samson (Judges 13.25). Samson was the pastor of the nation of Israel, the judge, the political leader, the spiritual leader, the champion – all of it – for over twenty years, yet in all that time he never stopped being a play boy. I’ve met pastors like that sadly. I’ve met people who commit fornication then go straight to church, it doesn’t affect them at the time because they have a split personality. They come to church and are the most expressive in the church! They are godly and worldly at the same time. Samson even used prostitutes, one woman after the other. Yet, God’s Spirit was still on him. For twenty years he was a minister playing games with God. It is very dangerous to be godly and worldly. Now, with my next post, I want to answer the question how do we handle people like that when we encounter them. It may be later today, or it may be in the week, but watch this space. One of the greatest dangers in the Christian life is a split personality. Just today I found out a minister who I have learned a lot from has been seeing prostitutes and beating his wife. That’s a split personality – who he is in the pulpit is not who he is in private. People called Christians but are secret addicts to all sorts of substances and habits are dangerous. People whose lifestyle in public are not their private lifestyle are dangerous. It is dangerous to be one of these people, it is dangerous to know these people. The main reason people have a split personality is that they love impressing people – that is what means the most to them. They have a lifestyle in church and a lifestyle outside of church. It is living like what Jesus called a hypocrite – a total deceptive lifestyle. You know one of the hardest things for a doctor to do is make an accurate diagnosis of a disease or sickness – when they have done that they have won half the battle because they know what they are dealing with. As a pastor I have the same problem when people are deceptive and hypocritical: I cannot help because they are hiding the problem from me. God expects that as His children, with His life inside us, that we live a clean life. Not a life of fornication, adultery and uncleanness (have a read of Ephesians 5.3, see what I am talking about). Now the best (or worst?) example of this kind of split personality in the Bible was probably Samson. He had just drastic split behaviour that every one of us can learn from him. Firstly, he was a man who was unevenly yoked. That is a massive issue. Part of Samson was separated to God and holy – you could see that by the fact he never cut his hair as part of his Nazarite vows. But there was another part that was yoked to the world and the things of the world. That is the first sign and the starting point of a split personality – part of you wants to go with God, and part of you wants the things of the world. You have to accept that you cannot ever have both, and you need to choose. A failure to choose and you fall flat on your face and end up with nothing. 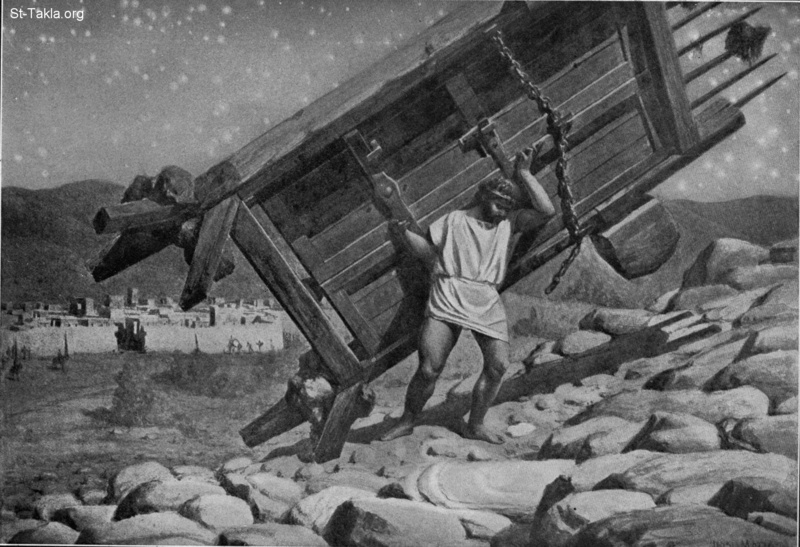 Samson was a Nazarite, someone who lived differently from others because of his devotion to God. He didn’t drink, he didn’t cut his hair, he spoke differently, he lived differently. It was a sign that he was devoted to God. Everyone could see that Samson was devoted to God. At the same time, in secret, he was evil. He was tied to the devil and the world! These two things were going on in his life at once. This man would not cut his hair, was a “charismatic Christian”, had a public sign that he was a man of God, but he wanted a wife that was an unbeliever (Judges 14.1-3). A man anointed by God but a man who wanted worldly pleasure too! There are many Christians doing this today, many Samsons in the church, and many of them in ministry! There are many pastors with split personalities and many people in the church with split personalities. There is their church personality – sweet, and kind, and holy, and praisy, and prophetic, and anointed – holier than thou! Then there is their not around the church personality – carnal, selfish, hungry for the things of the world. Some of you reading this blog – I am speaking directly to you. You are in the church, you are born again, you are ministering. But you are on the other side of things playing with the world and chasing the world and lusting for the things in the world. Your best friends are unbelievers and the girls you chase are unbelievers – you are Samson. You are not in a council-run youth group. You are not in a dead Presbyterian church. You are in a Spirit-filled, tongue talking, on fire youth group in a living church, you have heard the gospel, you have even been to Bible College. You hear life changing sermons over and over and over and over, yet your best friends are unbelievers. You are Samson, and you have a problem. Today, admit you have a problem. Speak to your pastor, find some Christian friends to pray with you, start to change things, start to spend more private time with the Lord and in the Word. Today, we start dealing with this, so that you will be single-minded, not double-minded. Next week, I will continue down this theme, on how this condition of a split personality affects your thinking and how to get free. Watch this space!